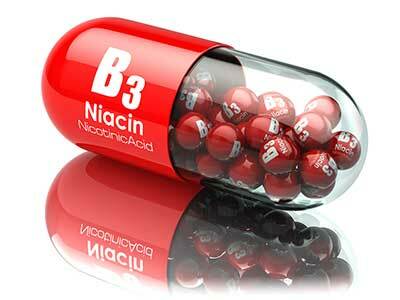 Niacin is the common name for nicotinic acid, or, Vitamin B3. The daily multi-vitamin you might have in your cupboard will only just scrape you up to the Recommended Daily Allowance (RDA). It is very available in most rounded, healthy diets as well. Supplementation beyond that would seem like overkill, were it not for a second group of benefits that present themselves at higher dosages of Niacin. This article will explain everything you need to know. To prevent deficiency related health problems, the RDA has been set to 14mg and 16mg for women and men respectively. Increasing HGH can improve muscle tone and reduce fat storage. Furthermore, it boosts mood, cognitive function and general vitality. Vasodilation – increased blood flow – helps more oxygen and nutrients get to the muscles, allowing for a deeper and more intensive workout. This, of course, elicits greater results in strength and fitness. The traditional capsule form of Niacin supplementation is the same as most oral supplements. The problem with them is that much of the valuable nutrient doesn’t make it into the bloodstream due to various battles with stomach acids and enzymes. Liposome encapsulated Niacin is likely to replace oral capsules soon. This cutting-edge technology involves the Niacin (or any nutrient) being coated in a choline based compound which helps it enter the bloodstream. The product is in the form of a small strip which is placed on the tongue. It melts instantly and gets into the blood within minutes. = No destruction of the nutrient AND very fast acting. Most benefits come at the 1000mg (1g) mark for oral capsules and tablets. The tongue strips can have much lower dosages as they are as effective as 30 or 40 of the capsules. ‘Sustained release’ capsules should be avoided as these are taxing on the liver. A multi-vitamin will not provide the extra benefits of Niacin, and will literally include the RDA. The vasodilation effect is synonymous with a fairly unique physiological effect: reddening of the skin, which may or may not be accompanied by a slight tingling feeling. Known as the ‘Niacin Flush’, it’s a harmless effect, and is actually a sign that the product is working well. People who don’t know about the flush are often slightly concerned when they first experience it. Most people enjoy it once they understand it. 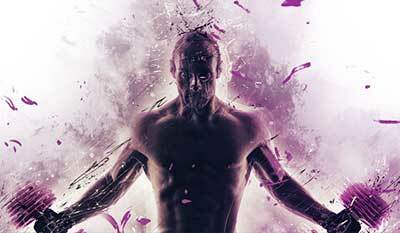 Average users in good health will experience no problems with Niacin supplementation. Just stick to the dose on the packaging. Due to its potency at higher dosages, people taking prescription medication OR that have existing medical problems, are advised not to take any supplement like this without the approval of a doctor. Pregnant and breastfeeding women should avoid supplemental doses, though they will usually find 17mg – 18mg in their pre-natal and post-natal multi-vitamins. 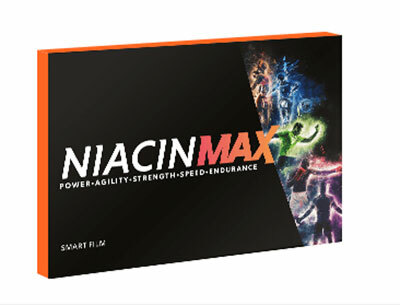 Niacin is rapidly becoming known as a legal performance enhancer in the sports world, and certainly has many benefits overall, including anti-ageing, improved cognition and heightened energy, vitality and wellbeing. Of the forms available, we have switched to the Liposome Tongue Strips because they are much more effective and better value for money. Timing is much better also because of the virtually instantaneous entry to the bloodstream. Supplementation of Niacin has benefits for both men and women, active and sporty, or simply looking for a boost to wellness, vitality and longevity.